Water, Hydrolyzed Soy Protein, Glucose, Iodized Salt, Flavour Enhancer (Msg), Sugar, Colour (Caramel), Food Acid ( Citric), Preservative (Potassium Sorbate). 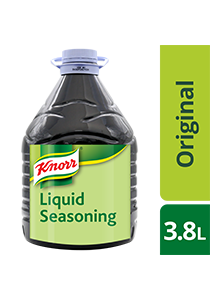 Use 30ml of Knorr Liquid Seasoning for every 1 kilo of meat. Great for dipping, marinating, sprinkling and cooking.